Josh Mathis is the person that you feel lucky standing next to in a crowded room of strangers. Witty, astute, and affable, Josh has a natural talent for bringing people together and leading the conversation to an insightful place. Before stepping into his role as business development director, Josh built system-wide improvement programs in healthcare and led software development teams in the retail industry for Propeller. His prior experience spans the music, art, nonprofit, and energy sectors. Always up for a new challenge, Josh attempted skydiving at age 23 to overcome a fear of heights – it didn't work. 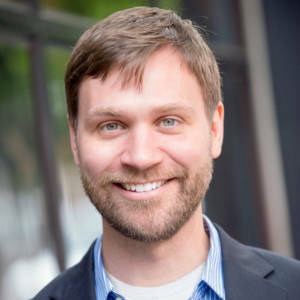 He has an MBA from Portland State University with a focus on social entrepreneurship and a bachelor’s degree in international studies from The Ohio State University.